What Creature Has Made its Home in My Compost Heap? 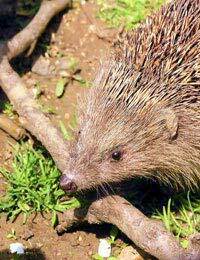 Home > Ask Our Experts > What Creature Has Made its Home in My Compost Heap? Over the years I have been building up a type of compost heap under and behind my rhododendron and when tidying the area yesterday, I noticed a small round hole in the middle of the heap (approx size of a ping pong ball). There is also evidence of a sort of 'run up' to the hole, the hole seems to go quite deep into the heap. Something has obviously made my heap it's home, would you have any suggestions as to what might be in there? A compost heap that’s been left largely undisturbed for a few years sounds like a haven for all manner of small creatures. Many types of mice, rats, toads, frogs, and even bees will nest in this warm, quiet safe-haven. Don’t be surprised if your compost heap turns out to be home to a multitude of warm and cold-blooded critters! A hole approximately the size of a ping-pong ball, with a run up sounds as if your resident could be a rodent. Wood mice, rats and shrews often like to build ‘chambers’ within an undisturbed compost heap, especially if the heap is fairly dry. So obviously, you have two choices – you can either allow the residents to stay put, or evict them. By allowing them to stay, obviously you run the risk of them breeding – they may disperse and you’ll be none the wiser, or if you grow your own vegetables, you may notice a decrease in your yield. If you wear gloves when tending to the heap, hygiene also won’t be so much of an issue. You could trap – humanely (trapping and relocating) or baiting with the intent to kill. Killing rodents in areas that are more rural will make little impact in the overall scheme of things. Perhaps a more subtle approach can be taken - if you’re a live-and-let live kind of person, but would rather your compost heap wasn’t home to any furry creature, you could try a few things that might encourage them to relocate themselves. Firstly, rodents prefer a dry, warm and quiet area to nest. You could gradually soak your compost heap so that they move out to find somewhere else more suitable. Regular soaking of your compost heap will have two benefits – firstly, the likelihood of any mammal moving in will be less likely. Second, you’ll also help the speed along the decomposition process. You could also try gradually re-siting your compost heap. Never stick a fork straight into the heap, as you could easily skewer whatever is nesting, whether it be frog, toad, hedgehog or rodent. You can start your relocation by laying a mesh of fine gauge chicken wire to discourage anything digging into the compost heap. Then transfer the top layer of your compost heap so that it becomes the bottom layer of your new compost heap. Leave it a couple of days before relocating the next layer. Not only will this also help you ‘turn’ your compost heap, but gives your compost heap squatter a chance to make a quick exit when no one is looking!